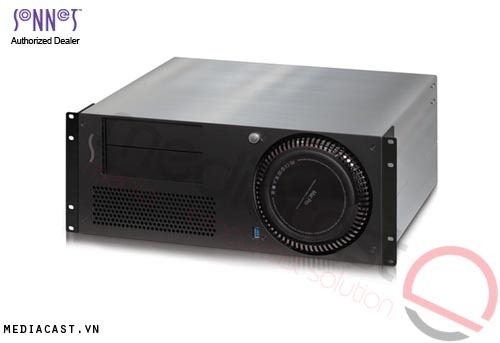 The Echo Express III-R Thunderbolt 2 Expansion Chassis for PCIe Cards from Sonnet mounts in a rack space 2U tall in height. 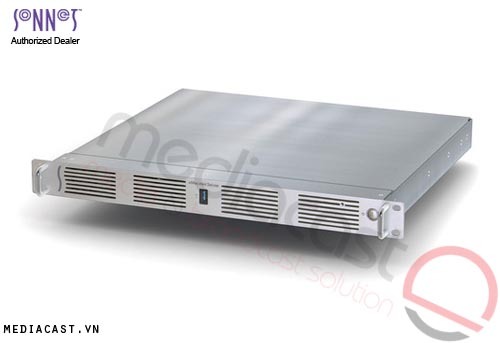 It is 16" (40.6cm) deep, making it perfect for use in a wide range of mobile racks, carts, rack cases and server rooms. The expansion chassis even saves space for other equipment. Echo Express III enables you to connect 3 compatible full-size professional video capture, audio interface and other special-purpose cards to your iMac, Mac mini, new Mac Pro, MacBook Air or MacBook Pro with a Thunderbolt 2 port. 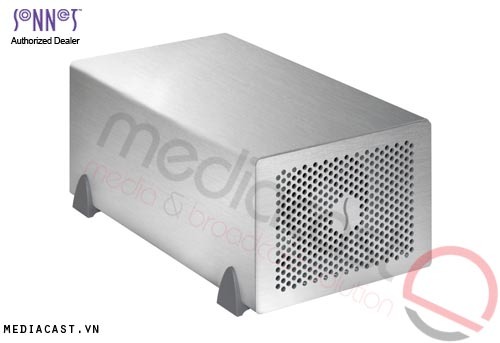 Featuring 20 Gbps Thunderbolt 2 technology, this Echo chassis ensures optimum performance from the most demanding PCIe cards with every compatible computer. 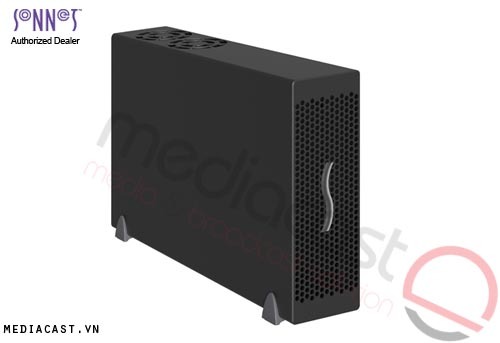 It integrates a universal 300W power supply and includes a 75W auxiliary power connector for cards that require supplementary power. In addition, the Echo Express III is environment-friendly; it automatically powers off when the connected computer powers off or sleeps. The use of larger, slower-spinning fans in the Echo Express III allows for maximum noise reduction. Two Thunderbolt 2 ports support daisy chaining of up to six devices to a single port on your computer. 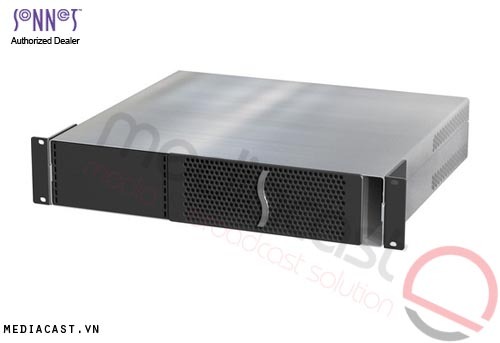 Sonnet's Echo Express III-R makes possible to use full-size professional video capture, audio interface, SAS & SATA HBA, 8GB Fibre Channel, 10 Gigabit Ethernet and RAID controller PCIe cards with your Thunderbolt 2 port-equipped Mac. 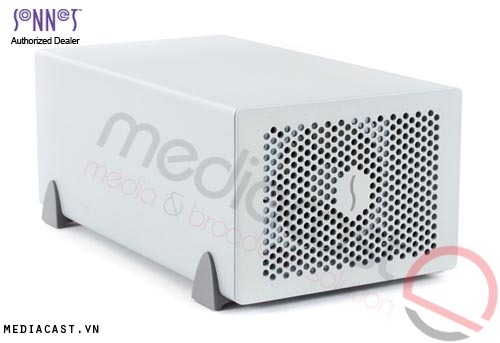 Featuring 20 Gbps Thunderbolt 2 technology, this Echo chassis ensures optimum performance from the most demanding PCIe cards with every compatible computer. The Echo Express III-R's heavy-duty steel enclosure not only provides secure mounting for the inner assembly, but also supports maximum airflow for cooling, regardless of where it is installed in a rack. It saves space for other equipment as well. Utilizing the optional Echo Express III-R Mobile Rack Kit, you can install two 5.25" form factor mobile rack devices in the III-R's enclosure. 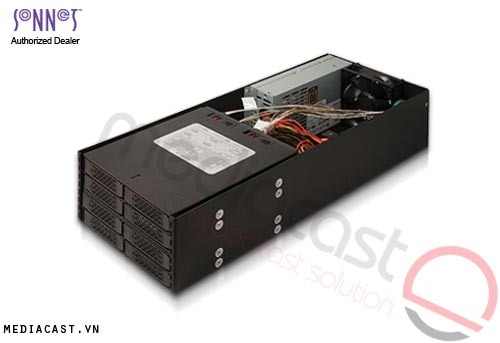 The enclosure includes an internal 300W universal power supply with a 75W auxiliary power connector and power harness cable to provide ample power for cards with high-power requirements. Two large, remarkably quiet and temperature-controlled, variable-speed fans provide better airflow management, ensuring that hot-running cards and the chassis' components remain reliably cool without you having to install an extra blower in one of the three slots. A RED Rocket card normally takes up two PCIe slots-one for the card itself and another for the BNC connector bracket (for HD-SDI output). However, the Echo Express III-R is designed to make the card work in one slot without sacrificing any connections. 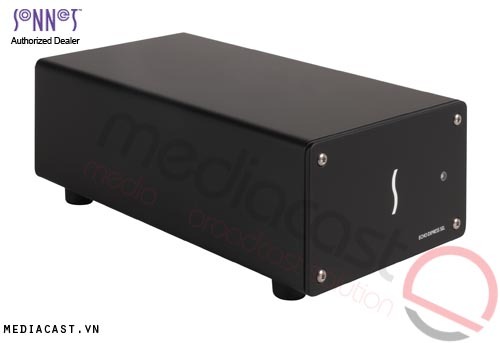 The chassis includes mounting holes designed specifically for the installation of two BNC connectors, enabling you to install the RED Rocket card in one slot and its BNC connectors in the Echo chassis' mounting holes, while leaving the two remaining slots open. Box Dimensions (LxWxH) 22.0 x 20.3 x 4.6"